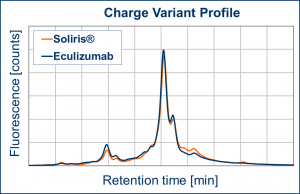 You do not want to wait until you have your desired biosimilar cell line in hands? 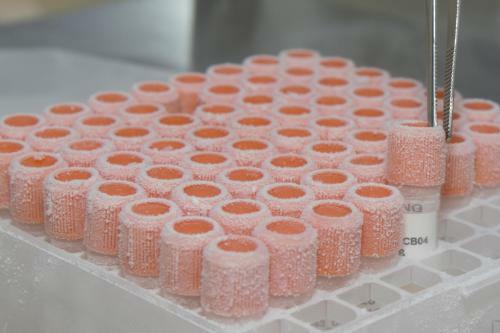 UGA Biopharma promote a broad spectrum of Ready to Use Biosimilar Cell Lines including documentation which are ready to out-license to a collaboration partner. In addition UGA Biopharma can accelerate your way to success by providing an optimized bioprocess, downstream process and analytical data and methods. 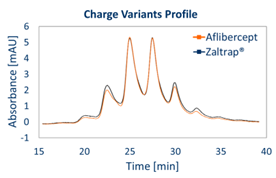 Aflibercept (Zaltrap®) is a recombinant fusion protein with complex post-translational modifications. Therefore deep understanding of biosimilar development is required to develop a biosimilar like Aflibercept. 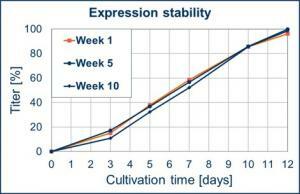 Remarkable Bevacizumab clone stability for at least 10 weeks of cultivation. Biosimilary of Darbepoetin alfa expressing cell line could be improved. Please consider the isolectical focusing (IEF) gel of Darbepoetin alfa biosimilars and the Aranesp® originator. A outstanding product concentration higher than 7 g/L could be reached during the Dupilumab development project! 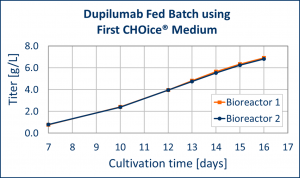 The first CHOice® Medium works very well for Dupilumab clones. Very good biosimilarity achieved in a challenging Eculizumab development project (IgG2/4 hybrid antibody). 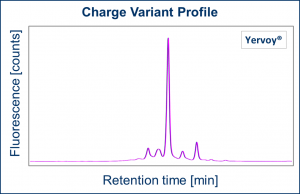 Typical charge profil of Yervoy®. The primary structure of a biosimilar has to be identical to the originator molecule. 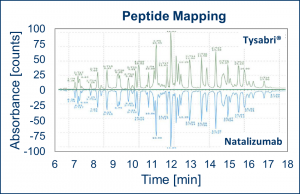 The result of the peptide mapping of the Natalizumab biosimilar is depicted here. 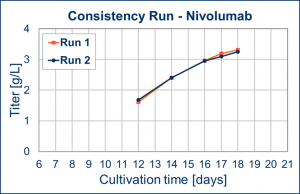 A product concentration over 3 g/L has been obtained during a Nivolumab consistency run in stirred bioreactors. 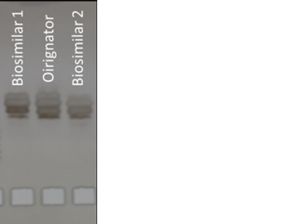 A product concentration of 3 g/L has been obtained during the Omalizumab biosimilar development project. 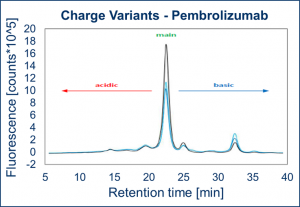 Pembrolizumab (IgG4) biosimilar development project has been finalized in a very short time line – according to the High Speed Workflow of UGA Biopharma! 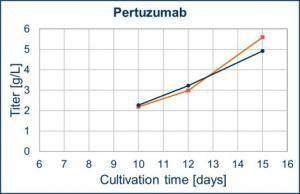 Outstanding productivity higher than 5 g/L reached during the pertuzumab development project! Pool stage finalized. 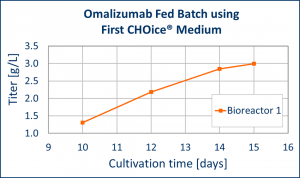 On request, stable Vedolizumab clones can be developed within weeks! This biosimilar project is under development at UGA Biopharma GmbH.